On 1 September 1939 Nazi Germany attacked Poland. Second Lieutenant Jan Karski was with his regiment, the Polish Army Mounted Artillery Division, at Oswiecim on the Polish-German border. A combination of the Luftwaffe and German tanks had reduced his barracks to ruins. His regiment was ordered to retreat to Cracow. After fifteen days of marching Jan Karski eventually made it to the city of Tarnopol. There he discovered that the Russians had invaded Poland from the east. The Soviet army proceeded to relieve the Polish soliders of their weapons and took them as prisoners. Jan Karski and two thousand other Polish army prisoners were marched to the railway station and loaded onto a freight train. They travelled for five days heading east to Russia. Their destination was a group of buildings which had at one time been a monastery. Ordinary soldiers were given accommodation in the stone buildings while officers had to make do with the wooden barns. Jan Karski's one thought was to escape. A fellow prisoner, Lieutenant Kurpios, came up with an escape plan. He told Jan Karski that in accordance with the terms of the Ribbentrop-Molotov pact the Germans and Russians were to exchange prisoners of the rank of private. The Russians would hand over to the Germans all Poles of German descent as well as Poles born in parts of Poland which had now been incorporated into the German Reich. Karski exchanged uniforms with a Polish private and requested that the Russians return him to the Germans. The Russians took Karski and other prisoners to be exchanged to Przemysl, a town on the new Russian-German border, to be handed over. The Germans then took them to a camp at Radom and later put them on a train of freight cars to be taken to a place of forced labour. On the train journey Jan Karski and others in his freight car managed to escape by jumping from the moving train. It was now mid-November 1939. Jan Karski made his way to Warsaw and reflected on Poland's defeat. In January 1940 Jan Karski travelled to Zakopane, five miles from the Polish-Czech border. There he met his guide and two other men who were attempting to escape from Poland. They pretended to be a skiing party and set off through the Slovakian mountains. They reached the Hungarian frontier and split up. Karski went to Kosice, where an agent of the Polish underground lived, and then on to Budapest. From Budapest, he departed by train on the route of the Simplon-Orient express through Yugolsavia to Milan, Italy. From there he travelled to the French-Italian border where he was scrutinized by Polish intelligence officers before being sent on to Paris by train. In Paris, it was the time of the "phony war". France was full of German spies. Jan Karski made his way to Angers, a city four hours southwest of Paris. This was the seat of the Polish government in France. He met General Wladyslaw Sikorski. After his meetings with Polish government leaders Jan Karski retraced his steps back to Poland. He took the Simplon-Orient express train through Yugolsavia to Budapest, then travelled to Kosice before walking back through the mountains, with his guide, into Poland near the end of April 1940. Two weeks after arriving in Warsaw he was once again instructed to go to France by the same route. This time the trip did not go well. Karski was arrested by German gendarmes while sheltering in a peasant's hut near the Hungarian border. He was taken by them to a prison at the Slovakian military barracks in Preszow. There he was interrogated and beaten by the Gestapo. Jan Karski attempted to take his own life in his prison cell but awoke to find himself in a Slovakian hospital. The Gestapo later transferred him to a hospital in the south of Poland. From there the Polish underground were able to facilitate his escape. They offered to take him into the Warsaw ghetto and to a death camp where Jews were murdered and tortured in their thousands. Two days later Jan Karski was smuggled into the Warsaw Ghetto. He was taken to a Jewish death camp and gained entry by impersonating an Estonian militia man. There he was witness to the mass murder of Jewish people. Jan Karski left Warsaw for London by train. First travelling to Berlin and then on to Brussels and Paris. From there, with new identity papers, which stated that he was a French citizen of Polish origin, he travelled by train to Lyon. He then made his way to Perpignan in southern France. A guide helped him to escape through the Pyrenees and he then travelled to Barcelona, Madrid and Gibraltar. He arrived in England aboard an American bomber aircraft. 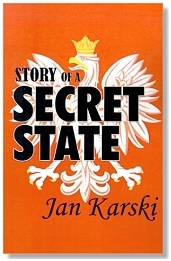 Jan Karski was asked to see Polish Prime Minister General Sikorski and he told him about the plans of the Polish underground for the future of Poland. General Sikorski told him he was to be decorated with the Virtuti Militari order. Publisher - Published in the UK in 2011 by Penguin Classics. Previously published in 2001 by Simon Publications. Originally published in 1944. Jan Karski died in Washington (USA) in 2000 aged 86. Michael Kaufman wrote in The New York Times (15 July 2000) in Jan Karski Dies at 86; Warned West About Holocaust. Mr. Karski became a skilled courier for the underground, crossing enemy lines as a liaison between the Polish fighters and the West. He was captured by the Gestapo while on a mission in Slovakia in 1940 and was savagely tortured. Fearful that he might reveal secrets, he slashed his wrists and was put into a hospital. An underground commando team helped him escape, and he resumed his work as a clandestine liaison officer...In July 1943, Mr. Karski arrived in the United States. Two months earlier, attempts by the Germans to liquidate those Jews still remaining in the Warsaw Ghetto was met with armed resistance...He kept telling what he knew, honoring the promise he had given to the two men in the Ghetto. A secret meeting was arranged between Mr. Karski and President Roosevelt...Mr. Karski was planning to return to Warsaw and resume his clandestine work, but his superiors told him that his identity had become known to the Germans and ordered him to remain in the United States. His mission then was to promote the cause of Poland, which once freed of German occupation would have to contend with Stalin's designs. Julia Pascal wrote in The Guardian (15 July 2000) in Jan Karski - Polish resistance hero who risked his life bringing evidence of the Holocaust to the west. In the list of righteous gentiles, the highest compliment Jews can bestow upon those of other faiths, the Polish Catholic Jan Karski, who has died aged 86, stands alongside Oskar Schindler. It was Karski, an eminent member of the wartime Polish resistance, who, on clandestine visits to the west, gave the Allies some of the first eyewitness accounts of the Holocaust. Western leaders responded with disbelief and incredulity. This page was added on 27 October 2009. Updated on 15 May 2011.